It may be the last week of term but there is no slowing down for us! We have been very busy making changes to our role play area. Following conversations with the children about making cakes using playdough and which cakes were their favourites, we got busy on Monday working with the children to create a café/bakers area in our role play corner of the nursery. This led to discussions about visiting a real bakers, with children suggesting, “why don’t we go to see the bakers in Tesco, then we could go to Clarks Bakery on a trip?” Well, that’s just what we did! Danny talked about the procedure for roll making, and we were shown the texture of the dough inside of a roll, and even got a sneaky wee taste! We were also shown a tray of empty pie cases, and Danny told us how they make their pie shells to be vegan, vegetarian and suitable for most allergies – with the only 2 ingredients being water and flour. We were given a taste of the pie shells also, and asked to compare the texture of both the roll and the pie shell. We then came back through to the preparation table, where they had readymade dough laying out for the children to roll out and explore. Danny talked to us about the main ingredient in bread being yeast, and we got to smell it and the children all agreed it smelled like cheesy feet! He gave us a mini experiment to carry out after we had a chance of rolling out fresh dough, and it was to mould a piece of yeast into a ball and add a little drop of salt to it, Danny explained to us that this was going to be a chemical reaction and that we would need to watch closely for it happening on our plates. Mr Alan Clark came to meet the children and tell them all about his experiences in the bakery industry, and that he had been a baker since he was 10 years old! He told us and showed us how to knead dough properly, and the children enjoyed copying his actions with their dough. A few children even told Mr Clark that they wanted to be real bakers when they grow up! He was delighted at this response and told them it was a very enjoyable job. He brought through some freshly baked loafs of white and brown bread, and the children got to taste bits of these and compare the taste of what they preferred. After the bread tasting, we shifted our attention back to our paper plates of yeast and salt, and watched for the salt dissolving into the yeast to create a melting liquid that they use in bread. We then started to round up our trip when Danny suggested, because the children had been so good, that the bakery would provide us with a treat bag each, and some cake boxes/bags/props to take back to our nursery to recreate in role play what we were so lucky to experience today! We then all left the bakery feeling hungry with the scents we smelled, and eager to return back to nursery to share with everybody what we were able to see and learn on our trip! The children have been continuing their learning about syllables – “parts of words” this week, with everyone clapping out syllables of Sparkle words, names and lots of other words. We were lucky enough to have a visit (afternoon only sadly) from a visiting music specialist, David, who worked with the children to learn about the different tones to music – high and low. In the art area, we have been talking about different objects for printing and the textures they have and the patterns they make. Another part of our plan has included learning to balance. The children are becoming skilled at this and are enjoying practising this in different ways. You can see some balancing skills being developed at the ActivPanel, with the children watching and copying some skill videos. Outside, we have continued to look for signs of spring, and it is getting easier as the days get warmer. There have been more bug sightings this week! We finished our learning about bears (Where’s My Teddy? ABC&Beyond text) with many children bringing their teddy or other cuddly toy to nursery. Some groups had a Teddy sing-a-long, where we sang the bear songs we had been learning to our toys! We think they enjoyed it! This week has seen us begin our new ABC & Beyond text, Ernest, by Catherine Rayner. It’s the story of a rather large moose, who finds he has trouble fitting inside the book! You can help your child learn these by using them in context in conversation. That’s all we’ve time for this week. You can see more photos on the screen in the foyer. Don’t forget to follow us on Twitter @menzieshill_ns Have a great weekend everyone! Also this week, we have been linking our ABC & Beyond text, “Where’s My Teddy?” in lots of areas. Our family learning groups continue to go from strength to strength, with taster sessions from Urban Moves Dance group this week. As this was only a taster session, we will evaluate your feedback and look to address your thoughts. It sure looks a lot of fun! Play on Pedals is in week 2 just now, so children are learning how to balance. This is an important skill to learn before you try a bike! It’s trickier than you’d think! Looking good guys! Hope you’ve enjoyed out update of some of our learning this week. Keep up to date on our Twitter page, @menzieshill_ns . Have a great weekend! Don’t forget it is the mid-term holiday on Friday 15 and Monday 18 February and nursery remains closed to children and families on Tuesday 19 February for staff in-service training. We re-open for children on Wednesday 20 February. In our 3 – 5 room, we have moved to a new ABC & Beyond text for this planning session you may be familiar with. We are reading “Where’s My Teddy?” by Jez Alborough. Each book we look at, we choose some “sparkle words”, words which may be new to the children’s vocabulary. We have been discussing what the children think these words might mean, in relation to the story. You can see from the photos below, some children have been acting out their own interpretations of the words. Can you guess which photo relates to which word? You may be aware of our weekly visits to our local care home, where our children take part in activities, such as playdough, animal handling and games with our older friends. One friend has recently celebrated her 100th birthday. We made a card for her, and took it when we visited, with a bunch of flowers. We sang “Happy Birthday” to her of course! She was absolutely delighted! Unfortunately, we are not allowed to share any photos of our visits to the care home, but you can see below, how busy our children were, making the special card. Outdoors, the children have been really enjoying the large loose parts, creating some magnificent buildings, obstacle courses and vehicles. Loose parts really let children use their imaginations to the greatest extend, without having any pre-conceived ideas from items specific to a purpose. For example, bread crates can be walls, a car, steps, a tower, or anything! There is always an element of risk involved, but as research has found, controlled risk can increase children’s confidence and resilience. This week in nursery, the children wanted to learn about Mexico, because someone is going there on holiday. They looked at maps to find out where it is and looked at a Spanish dictionary to learn some words. The children learned how to say, “cat”, “pig”, “hello” and “goodbye”, in Spanish, and the fact that Mexico is next to Puerto Rico. Some other children were also talking about holidays to Australia. One of our families is soon to be emigrating there. They decided they would change the home corner to become a “travel shop”. One child suggested we could phone the travel agent to get some books to find a holiday. We did this and Ms D went to collect them one evening. We worked with the children to create some mind maps of their ideas. As you can see below, we have some experienced travellers in our nursery! Children began to create their own space in home corner deciding where the door should be. “We wont need the beds or tables now!” They made some drawings of aeroplanes to decorate the travel shop. You can see some photos so far of the children planning their area, phoning the travel shop and bringing into the nursery, the resources kindly donated by a local travel agent. We look forward to watching how this develops! Also this week, we have had the Code-a-pillar out a lot. Children can learn lots of problem solving skills, logic and pattern making skills using this cool toy. We have created obstacles for Code-a-pillar to go under, around and through. The children have had to consider which direction segment they will need to select to make it more in the correct direction. Continuing our love of Outdoor Learning, you can see the large Loose Parts play is always popular. Unfortunately that’s it for this week, but keep checking the Learning walls in the nursery and our Twitter Feed. Have a great weekend! Here are our Family Learning Groups for this week! Our ABC & Beyond book just now is “There’s A Bear On My Chair” by Ross Collins. The whole book is a fantastic rhyming opportunity, with the main rhyme being words which rhyme with ‘bear’. With the very cold weather we’ve had this week, the children have had lots of science opportunities exploring the frost and having fun drawing and pattern making in it. There has been lots of scope for discussion about where it comes from, why has it gone away on some parts of the garden, and how cold it is. The RSPB Garden Birdwatch takes place this weekend and Mrs T has been helping the children outside, to spot some garden birds who are starting to visit the nursery garden. We would love to erect our Birdbox Camera we had in the former Menzieshill Nursery garden, but we are struggling to find a suitable site. After the firepit on Wednesday, (macaroni in the morning and hot dogs in the afternoon!) we used the last of the heat on the pit to melt some fat to make bird cakes. The children were confident in their preparation – tearing up the bread, breaking up the apple slices, and stirring those and the sunflower hearts and raisins into the fat in the pan. We used the bird cakes to entice our feathered friends to visit the garden so we could record the different types of birds in our RSPB Birdwatch. Our Play Along Maths sessions for Mrs Hunter’s group is going well. 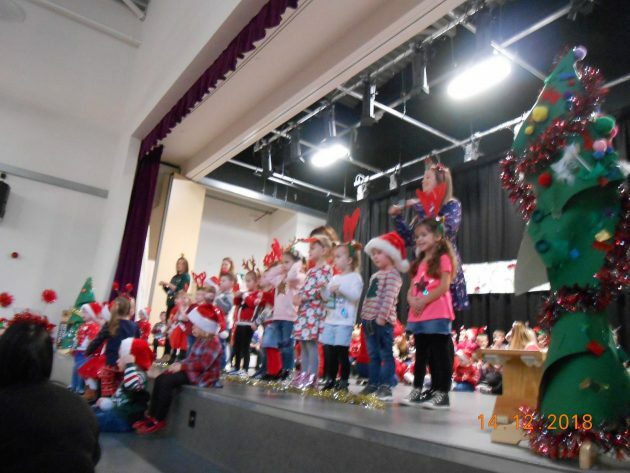 Children and parents are both enjoying the opportunity to work together. Some of our Bookbug sessions will run in partnership with Virginie (French tutor) to help support and promote French language. Virginie will be joining our sessions over this term, sharing stories and songs in French. Speaking of Bookbug, the Scottish Book Trust have launched a fab new Bookbug app, available for Android and IOS systems. Download from your app store for lots of new and familiar songs, rhymes and stories! It’s great! This week we have continued to welcome our remaining new children and families. It has been lovely to watch some of our older children beginning to make friends with them, showing them around and including them in their play. 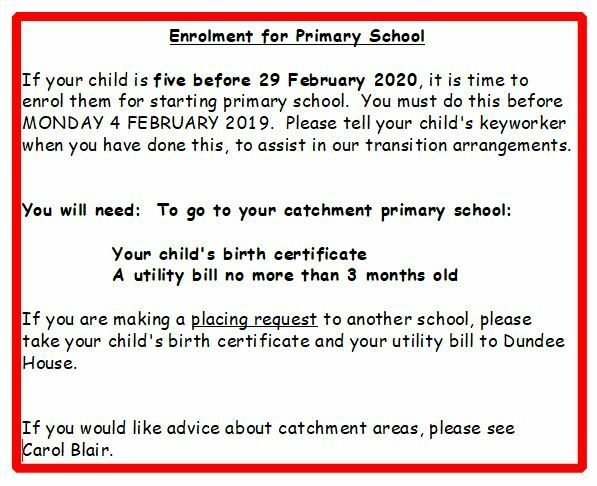 Another wee reminder to register for school – last day, Monday 4 February 2019. Some of our children attend yoga sessions in their own time, and have been keen to share their yoga knowledge with their friends. The children have been watching and taking part in some Cosmic Kids Yoga sessions online. The children have been really good at following the directions and copying the moves. They really seem to enjoy this and we will continue to offer opportunities like this. We are constantly encouraging the children to remember to wash their hands, particularly relevant just now with so many coughs, colds and bugs going around. This week, we had the use of a Ultra Violet light box. With staff support, the children have had the opportunity to apply the ‘special’ cream to their hands and place their hands under the light. The cream, although invisible on skin, shows up bright blue when viewed under the UV lamp. The children have been fascinated by this! After viewing, the children wash their hands, using soap and water at the sink, then return to the light box to view their hands again – Wow! Their hands are not bright blue any more, they are so clean! That’s what washing your hands does! The weaving in the art area has continued this week, with children’s fine motor skills increasing with practice. They are showing incredible perseverance with this, really trying hard to get the wool/ribbon/pipe cleaner etc through the fabric holes. For dates and times of Family Learning Groups, please check our information screen in the foyer and as always, watch our @menzieshill_ns Twitter feed. Happy New Year everyone! We hope you all had an enjoyable festive break! This first week back we have been welcoming our new children and families, getting to know each other and supporting the children in building new friendships. In the art area, we have been using hula-hoops with string attached as the inspiration for creative designs. The children were very interested in this and were keen to find ways to attach lots of different resources. We have been trying our weaving on a hoop, outside as well, as the activities we offer inside are also available outdoors. The children have been learning the “up and down”, “over and under” sequence to create the weaving pattern. We have also re-started out fire-pit snack for the new session, beginning with some cosy tomato soup and toast. Just what we need on a cold winter’s day outside. We reminded everyone about the very important rules needed for the fire-pit. Only walk when near the fire-pit. Once you are in the area, sit down on the benches around the fire-pit. Don’t come onto the ‘fire square’ unless an adult invites you. The current Play on Pedals sessions have only 2 weeks left, finishing on Friday 18 January, however we are planning to start more in the future. If you are interested, please let Carol, Wendy, Susan, Jenny or Vicky know. Our new Play Along Maths group begins on Monday 21st January at 2.15pm (pm) and Friday 25 January at 10.30am (am) – this session is for Mrs Hunter’s group, who have had letters with further details. Look our in your emails for a short PEEP group survey coming shortly. We really appreciate a high response. ** UPDATE ** Most of our songs uploaded now – hope you enjoy! Feel free to leave a comment here, either yours, or your child’s. Here’s a wee sneak peek of one of our numbers from the morning. We know you are all very keen to see the videos we’ve taken. We will share more in the foyer of the nursery and here, of the afternoon show too.